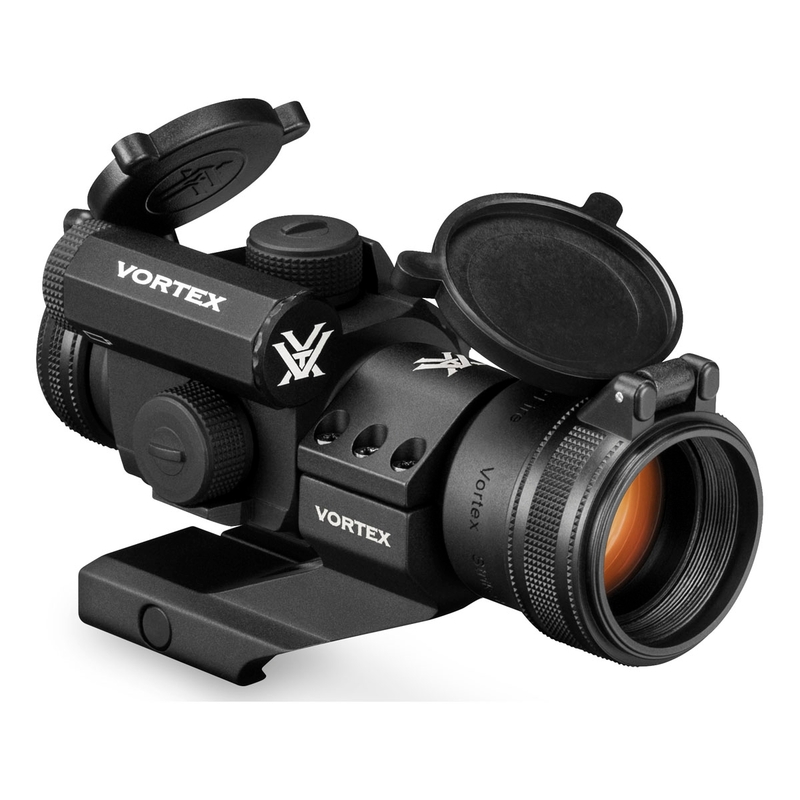 Vortex StrikeFire II Red Dot. 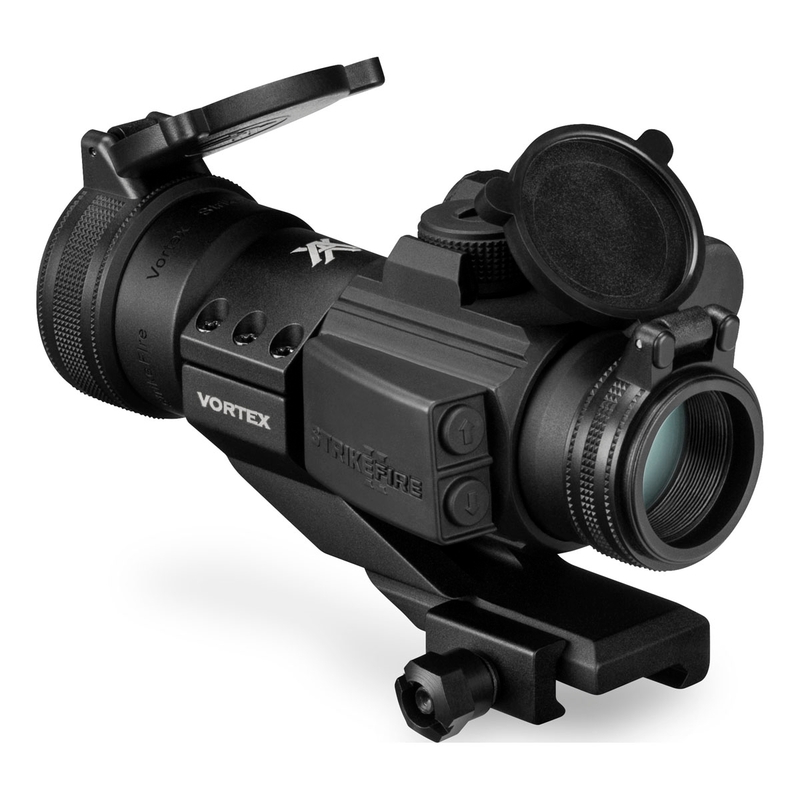 When situations demand split-second target acquisition and maximum field of view, mount up the StrikeFire II and shoot—both eyes open. Feature-rich, versatile and reliable, the StrikeFire II is a great choice for shooters who want a quality red dot sight, but don’t want to break the bank. Sleek rear-facing controls allow for easy adjustment of ten dot intensity levels—lowest two settings are night-vision compatible. 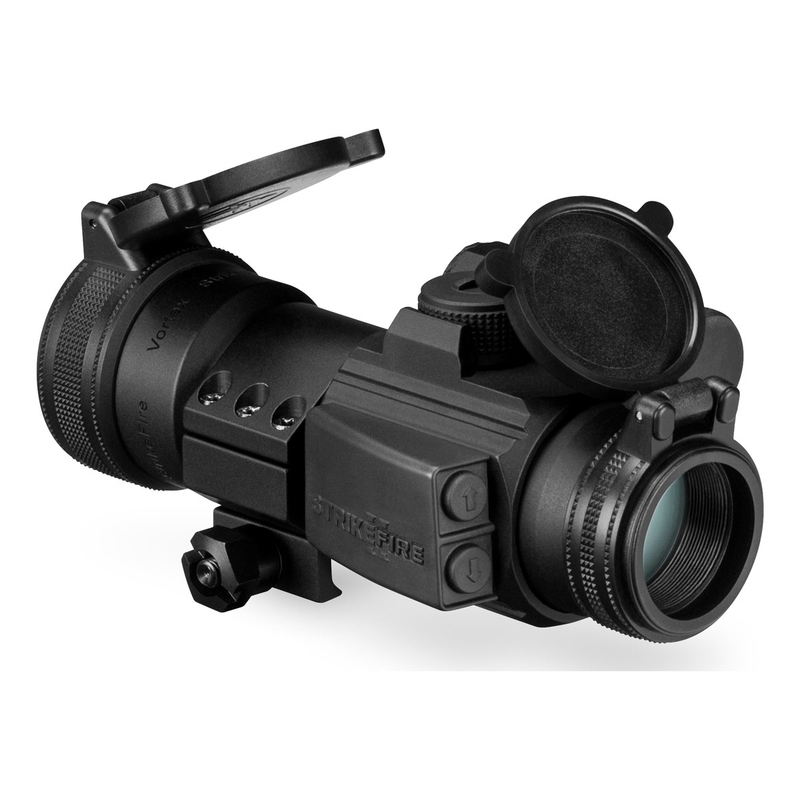 The 30mm aluminum alloy chassis provides extra-high recoil rating and is waterproof and fogproof. Fully Multi-Coated - Multiple anti-reflective coatings on all air-to-glass surfaces increase light transmission. Red/Green Dot - Allows shooters a choice of dot color. Parallax Free - All red dot and holographic sights will exhibit some small amount of parallax. Matching current industry practice, this small amount would be considered “parallax free” and will make a negligible difference in the StrikeFire II's performance. Single-Piece Chassis - Compact and lightweight. Waterproof - O-ring seals prevent moisture, dust and debris from penetrating for reliable performance in all environments. Hard Anodized Finish - Highly durable low-glare matte finish. Operating Temperature - Rated from -22 degrees to +140 degrees Fahrenheit. Cantilever Ring Mount - Puts the optic bore center 40 mm above the base, providing lower 1/3 co-witness with iron sights on flat top AR-15 rifles. Unlimited Eye Relief - Non-critical eye relief for rapid target acquisition. 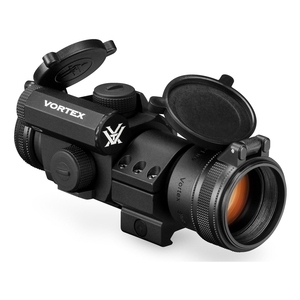 Adjustable Dot Intensity - Provides ten variable illumination settings—the lowest two settings are night-vision compatible. Battery Life - 12-hour auto-shutdown feature maximizes battery life. Typical battery life is 300 hours at maximum brightness and 6,000 hours at minimum brightness setting.